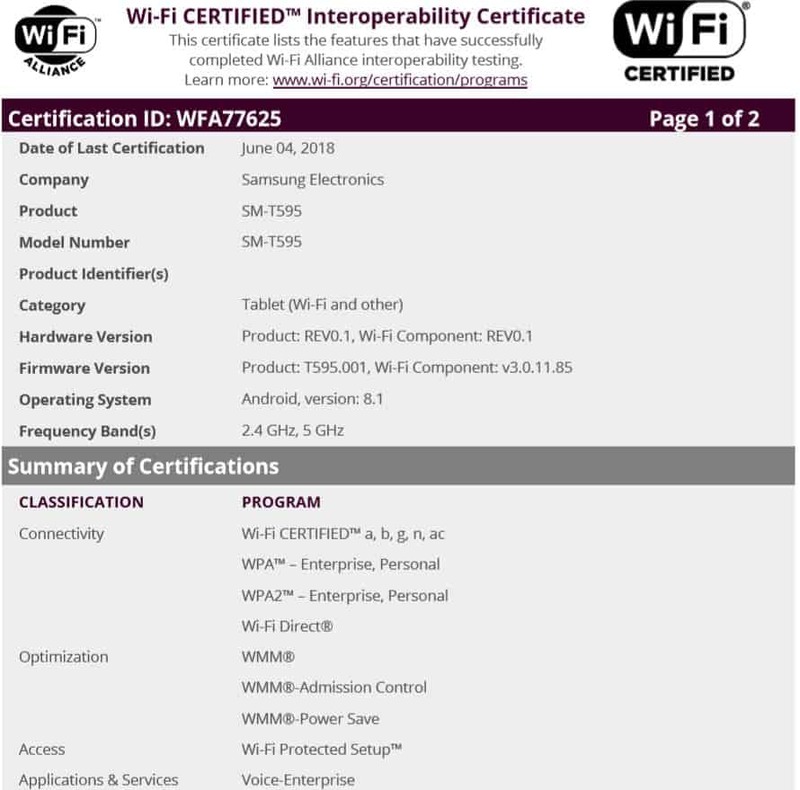 A new Samsung tablet has just received certification from the Wi-Fi Alliance on Monday, June 4, and it looks like the successor to the Galaxy Tab A 10.1. The new device that received Wi-Fi certification carries model number SM-T595, which indicates that it’s a successor to the 2016 Galaxy Tab A 10.1. That device had model number SM-T580 for the Wi-Fi-only variant, and SM-T585 for the Wi-Fi + LTE model. Judging by the model numbers, it seems that the upcoming Galaxy Tab A 10.1 that passed through the Wi-Fi Alliance is a LTE version. The device was also spotted at the Bluetooth SIG recently, which indicates that its official launch could be just around the corner. The new Wi-Fi Alliance certification lists the upcoming device with Android 8.1 Oreo. No Samsung Galaxy device so far has launched with Android 8.1 out of the box, which means that the Galaxy Tab A 10.1 (2018) could be the first one. On the other hand, this doesn’t mean that it will be a high-end device. The original Galaxy Tab A 10.1 came with mid-range specifications and a refreshed version that launched a few months after the first one added S Pen stylus support. No new iteration launched in 2017, so the 2018 model will be a direct successor. That said, the upcoming tablet is expected to feature mid-range specs as well, and come at roughly the same price point as its predecessor. As a reminder, the Galaxy Tab A 10.1 from 2016 featured a 10.1-inch PLS LCD display with a resolution of 1,920 x 1,200 pixels, a 16:10 aspect ratio, and a pixel density of 224 ppi. Under the hood, the device packed an octa-core Exynos 7870 processor with a Mali-T830 MP2 GPU. The original version had 2GB of RAM and 16GB of native storage space, expandable via a microSD card, while the refreshed version with an S Pen had 3GB of RAM and 16GB or 32GB of internal storage. Other specs included an 8-megapixel rear camera with LED flash, a 2-megapixel front camera, a 3.5mm headphone jack, and a 7,300 mAh battery. Samsung is expected to make some upgrades over the previous model, so the 2018 Galaxy Tab A 10.1 could feature a more powerful processor, more RAM, better cameras, and an improved experience overall, while still catering to the mid-range segment of the smartphone market. The post Samsung Galaxy Tab A 10.1 (2018) Spotted At Wi-Fi Alliance appeared first on AndroidHeadlines.com |.